“Krassi” Mayonnaise Factory was distinguished for “Effective management, competitiveness and care for the employee” in the prestigious ranking “Company of the Year”. 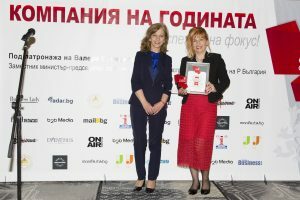 The Deputy Minister of Labour and Social Policy, Mrs. Rositsa Dimitrova, awarded the prize to Daniela Avdzhieva – manager of “Krassi” Mayonnaise Factory. This year the current topic highlighted in the ranking was DEVELOPMENT AND ESTABLISHMENT OF EMPLOYER BRANDING and development of the human capital. “We received the biggest award for Employer Branding at the fourth edition of “Company of the Year” in Bulgaria”, said Daniela Avdzhieva – manager of “Krassi” Mayonnaise Factory, “We never forget that people are our most valuable capital and here we should thank them. Our team strives to build mutual trust and to contribute for the establishment of corporate culture which recognizes the personal contribution, efforts and knowledge of the employees. “Krassi” Mayonnaise Factory is constantly improving its care for the employees by introducing activities directed to all people in the organization”. The “Company of the Year” award distinguishes those companies which have displayed professionalism and constancy during the establishment of the “Employer Branding”. 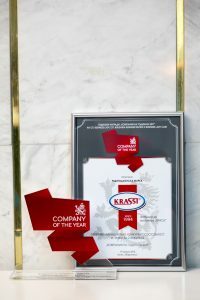 In the present situation of objective demographic crisis “Krassi” Mayonnaise Factory is a preferred employer and there is no workforce turnover which serves to prove that the company management successfully meets the challenge of winning over and organizing a team of people who will every day do their utmost for the benefit of the company and its successful mission.